UPDATE (1/13/10): Congratulations to reader Julie, who is the randomly selected winner of the guide. When my family and I dine out, we often try to patronize restaurants that have gluten-free menus or are gluten-free-friendly. Sometimes, however, we don't always have the option of choosing such a place. We were early adopters of the Triumph Dining restaurant cards, which we've had since 2005. (In 2005, co-founder Ross Cohen started the company in Philadelphia.) Triumph makes laminated cards in many languages that explain ingredient and cross-contamination concerns so that diners' meals can be prepared gluten free. Whenever we're at a restaurant that isn't familiar with the diet, we share our cards with our server and the kitchen. In recent years, Triumph has introduced two other portable products: a restaurant compilation and a grocery guide. The restaurant guide, in its 4th edition, lists over 5,000 restaurants covering all 50 states. 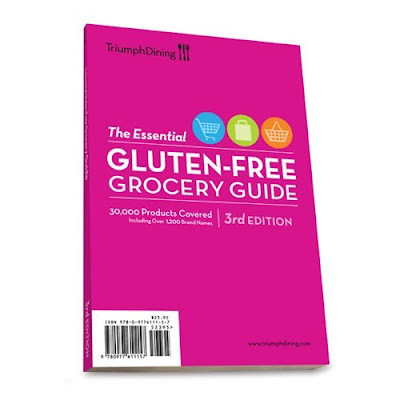 The newly released 3rd edition of Triumph's grocery guide is organized by grocery store aisle, with dairy products all listed in one place, frozen foods grouped together, and so on. 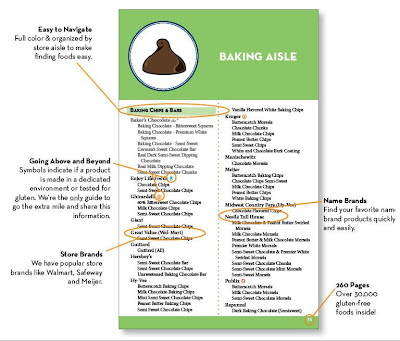 The grocery guide, covering over 30,000 products, is the only one available that shows which manufacturers disclose information about cross-contamination risks, dedicated production lines and facilities, and gluten testing of their products. Recognizing the high costs of gluten-free foods, Triumph has included store brands from some of the larger grocery chains to help shoppers stretch their budgets. Triumph Dining has been kind enough to offer a copy of its new grocery guide, a $19.95 value, to one lucky Gluten Free Philly reader. To enter the giveaway, leave a comment to this post about the best gluten-free grocery item you discovered in 2009. The restaurant cards and the guides (and discounted combo packs) can be purchased through Triumph's website, while the guides are available through Amazon.com. Most important is to make sure your comment provides a way for me to contact you. If your comment does not link back to an email address, blog or website through which I can get in touch with you (some past entrants have blocked their Blogger profiles), post your email address in the comment in the following format: "name[at]domain[dot]suffix." The giveaway runs now through Sunday, January 10 at 11:59 p.m. Eastern Time. I’ll randomly select one winner the next day and will contact him or her by email. If I don’t hear back from the person with his or her mailing address by the following Tuesday at 8 p.m. Eastern, I’ll select another name. Love your site! This year we discovered Joans bagels and love them. Wish we could get them closer to home! Also love cinnamon chex for my celiac 9 year old. Please enter me in the drawing. My two grandchildren have Celiac so we follow your column all the time. I found the guide very helpful in past years. I came across your blog and I have to tell you that I am thrilled! I live in the Northeast and work for a company with headquarters in Malvern, PA. I have been traveling to the Malvern area 3 - 4 times a year and finding places to eat that can accommodate the gluten free diet has been challenging - until now thanks to the wealth of information and helpful map in your blog! Also wanted to let you know that as the secretary of the celiac support group for children, I do the food product research for camp celiac and I am glad that your son enjoyed camp last August. PS - Please enter me in the Triumph Contest. If you need a favorite GF product, I love the Kind Nut bars and buy them by the case on Amazon.com. Our favorite new grocery item this year is EcoPlanet's Gluten Free Hot Cereal. This is what our first grader wants for breakfast each morning. Her favorite is the Apple Cinnamon Flavor. It has lots of nutrition without too much sugar. Hope you get a chance to try it! ian's waffle sandwiches, best gf product of 2009. they come in sausage/egg and cheese/egg flavors. 2 minites in the microwave gives you a hot, handy and satisfying sandwich. awesome! Handcrafted Green Chile and Cheese Tamales from Trader Joe's are an amazing gluten-free product I discovered recently. Very tasty and filling! What a great giveaway. My daughter and I were just diagnosed with Celiac, so this guide would be so hopeful. So far my favorite gluten-free grocery find has been Jamfrakas bars. My favorite new items would be Udi's breads (so soft!) and Julie's Organic GF ice cream sandwiches. I was thrilled when I found out Post Cocoa Pebbles were GF! My 13-year-old daughter has celiac so our whole family tries to eat GF. Our favorite new find is the classic white roll by Schar that we buy at Giant. We slice them in half, toast them in the toaster oven and use them for sandwiches or (her fave) topped with garlic oil and grated parm for delicious, crispy garlic bread. Please enter me in your giveaway and keep up the great blogging! My husband was diagnosed with celiac this year, and so we've both gone gf--your blog was great for a trip we took to Philly in September! Our favorite discovery recently was Schar's table crackers. I know you just reviewed Schar's but wasn't sure if you'd gotten to try the table crackers. We just had our first cheese and crackers in months! While they're prone to breakage, the taste is better than anything else we've tried so far.